Home / Behind Enemy Lines / Election Law / FEC / Gene Berardelli / Laura Doukas / Lee Zeldin / Millennials / Russell Gallo / Stony Brook College Republicans / Tim Bishop / VIolation / Wonky / Did A State University & A Dem Congressman Violate Federal Election Laws? Did A State University & A Dem Congressman Violate Federal Election Laws? The desperation is so thick in the air, you can almost cut it with a knife! 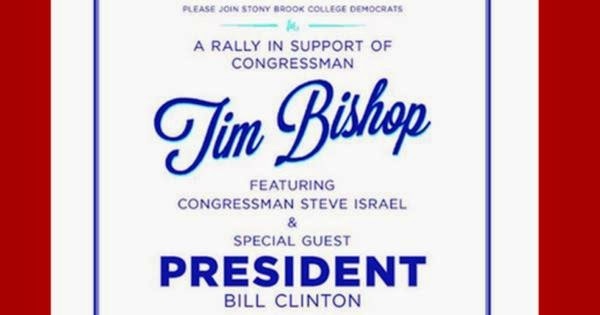 CampusReform.org reports that Cleta Mitchell, an elections attorney, examined an email promoting a campaign rally for Democratic congressional incumbent Rep. Tim Bishop (N.Y.) and former President Bill Clinton,and recommended the College Republicans group file a complaint with the Federal Elections Commission against both the university and Bishop’s campaign. “They are in violation of this section of the law because they are not supposed to show favoritism under the federal campaign finance laws,” Mitchell told the "watchdog to the nation's higher education system" run by the Leadership Institute. According to the site, the email in question went out to the entire student body using their school-issued email addresses urging them to sign up for the event. Mitchell claims that Bishop’s campaign could also be culpable for receiving an illegal contribution from the university. Bishop is in a nip-and-tuck battle with NY State Senator Lee Zeldin (R-Suffolk). You'll hear more from Laura on October 30th when she joins Behind Enemy Lines to discuss the issue in depth, so tune in next Wednesday at 10 PM!